A Party and Prizes for The Blackened Mirror! Blackened Mirror Season 1 has ended – and what a shocker of an ending that was, eh? If you haven’t seen it yet, it’s now on the web. 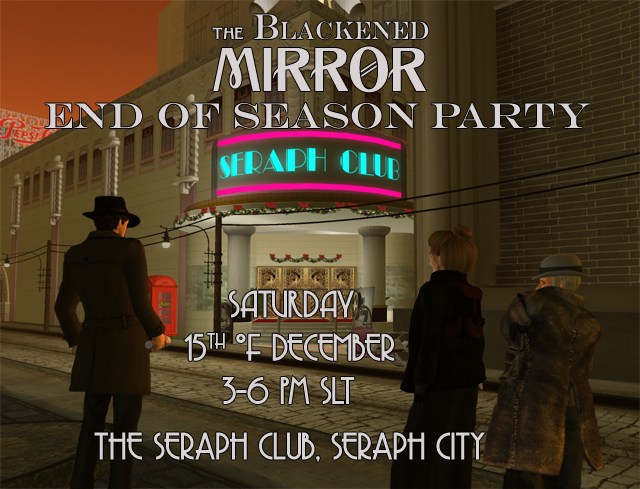 And we’re going to be celebrating the end of Season 1 with a special party today at the Seraph Club from 3pm till 6pm with Edward Pearse, who plays Harland Quinn’s friend, Edward, not only our host, but also our DJ. And Dress is definitely Film Noir! And how will you know if you solved the mystery of Death in Velvet? Well, for the very first time we will be broadcasting Episode 4 of Death in Velvet – which contains the solution to the mystery! This is going to be a really terrific party – make sure that you don’t miss it! Next Post: Prim Perfect Jigsaw: Everything looks Beautiful at the Avies!